Last month we gave you three tips for how to use Instagram to promote your restaurant or bar. This month we’re back with part two: three more important things to consider if you’re going to encourage your guests and staff to start snapping photos. 4. Raise your standard of clean – cameras are everywhere! Even if you don’t promote a custom hashtag for your bar, every customer has a camera in their pocket ready to upload pictures of bugs, dirty bathrooms, sloppy food presentation and grimy silverware – and tag those photos to your bar…forever! We know you’re already as clean as can be – we all are, right? – but you and your staff have to be even cleaner. Make the cameras work in your favor by going above and beyond in terms of cleanliness, even if you have to pay the staff to stay an extra 15 minutes each night. You don’t have to post hundreds of photos during the first week. Upload only your best photos and let your collection grow organically. Your customers will reward you with likes, comments, respect and more time spent at your bar. If they sense that you’re forcing it, it’s a turn-off. It’s common sense, but remember: In order to have great photos come out of your bar, you need great material for photos! If you want photos of your brand, you need cool branded items in the first place: coasters, glasses, tables, menus, signs, etc. If you want photos of theme nights, you have to throw the parties. Photos of food or specialty cocktails require you to put thought into creating them! Here’s the conclusion: Instagram will either show the world that your bar or restaurant is creative and well-managed, or it will penalize you for lack of imagination, cleanliness, care and so on. If you’re thinking about upgrading your bar’s décor, check out our online store. 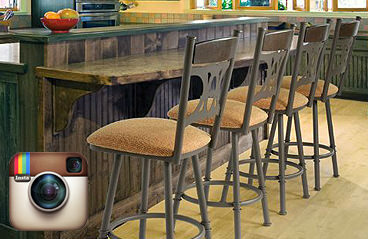 We have stools, tables and more for any style of bar – and we promise it will all look great on Instagram. Cheers!